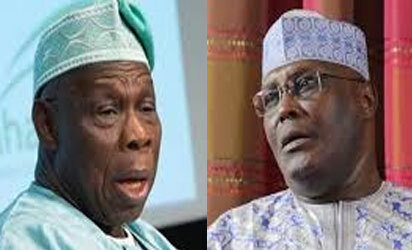 Former President Olusegun Obasanjo and his erstwhile deputy, Alhaji Atiku Abubakar, clashed, again, yesterday, after the former, said God will not forgive him if he supports Atiku’s presidential bid ahead of 2019 elections. Atiku, not one to shy away from a battle, immediately responded that his former boss should tidy up his relationship with God, instead of hanging his judgment with God on things concerning him (Atiku). Nobel laureate, Professor Wole Soyinka, however, at the weekend, claimed ego on the part of the former president, as he alleged that Obasanjo knelt to beg Atiku to help him win the second term ticket of the Peoples Democratic Party, PDP in 2003. “I do not have personal grudges with anyone,” Obasanjo said. “If you do not do well for Nigeria, you do not do well for all of us. “Most of you do not understand the way I operate. And I thought your own paper will understand better. “There is nothing that has not been thrown in the way of Atiku to cow him, to break him, to harass him, to intimidate him or to just make him uncomfortable. He has demonstrated that he has the tenacity to withstand it and he has the robustness of mind to remain calm. “We still believe that in the course of this journey, Chief Olusegun Obasanjo may have to reconsider his stand in line with the wish of the majority of Nigerians, which, in my opinion now, is that of all the aspirants for the office of President, that H.E. Atiku Abubakar has the experience, has the democratic credentials, has the vision, has the workable programme and is in sync with what the Nigeria nation needs now and can leapfrog it to higher levels of development.